လမုန့်အများစုသည် နုပြီးပါးသောအခွံအထဲတွင် ချိုသောအဆာရှိသည်။ အချို့လမုန့်အလယ်တွင် လဘဲဥအနှစ်ပါနိုင်သည်။ Rarely, mooncakes are also served steamed or fried. Mooncakes are considered a delicacy; production is labor-intensive and few people make them at home. Most mooncakes are bought at Asian markets and bakeries. The price of mooncakes range from $10 to $50 (in US dollars). ကြာစေ့အစာ (蓮蓉, lían róng): Considered by some to be the original and most luxurious mooncake filling, lotus paste filling is found in all types of mooncakes. Due to the high price of lotus paste, white kidney bean paste is sometimes used as a filler. ပဲအဆာ (豆沙, dòu shā): A number of pastes are common fillings found in Chinese desserts. Although red bean paste, made from azuki beans, is the most common worldwide, there are regional and original preferences for bean paste made from Mung bean as well as black bean known throughout history. ဆီးအဆာ (棗泥, zǎo ní): A sweet paste made from the ripe fruits of the jujube(Dates) plant. The paste is dark red in colour, a little fruity/smoky in flavour and slightly sour in taste. Depending on the quality of the paste, jujube paste may be confused with red bean paste, which is sometimes used as a filler. ဆန်ငါးခုအဆာ (五仁, wǔ rén): A filling consisting of 5 types of nuts and seeds, coarsely chopped and held together with maltose syrup. Commonly used nuts and seeds include: walnuts, pumpkin seeds, watermelon seeds, peanuts, sesame, or almonds. In addition, the mixture will usually contain candied winter melon, jinhua ham, or pieces of rock sugar as additional flavouring. ပိန်းဥအဆာ (芋泥, yu ní): A sweet paste made from taro, a tuber grown in many part of tropical Asia. The colour of the paste in the mooncake is purple and is most commonly used in Teochew crusty mooncakes. Chewy: This crust has a reddish-brown tone and glossy sheen. It is the most common type of crust used on Cantonese-style mooncakes. 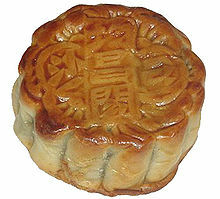 It is also the most commonly seen type of mooncake in North America and many western countries. Chewy mooncake crusts are made using a combination of thick sugar syrup, lye water, flour, and oil, thus giving this crust its rich taste and a chewy yet tender texture. Chewiness can be increased further by adding maltose syrup to the mixture. The dough is also baked into fish or piglet shapes (Cantonese: "Jue Zai Bang"; 豬仔餅; lit. "Piglet Biscuits") and sold at mooncake bakeries as a chewy snack. They often come individually packaged in small plastic baskets, to symbolize fish being caught or piglets being bound for sale. Flaky: Flaky crusts are most indicative of Suzhou-style mooncakes. The dough is made by rolling together alternating layers of oily dough and flour that has been stir-fried in oil. This crust has a very similar texture to the likes of puff pastry. Tender: Mooncakes from certain provinces of China and Taiwan are often made to be tender rather than flaky or chewy. The texture of this type of mooncake crust is similar to the likes of the shortcrust pastry used in Western pie crusts or tart shells. Tender crusts are made mainly of a homogenous mix of sugar, oil, flour, and water. This type of crust is also commonly used in other type of Chinese pastries, such as the egg tart.